Traditional tooth replacement solutions like dental crowns, fixed bridges and dentures restored the visible portions of patients’ smiles without taking into account the underlying supportive root structures of the teeth. Dental implants are posts implanted below the gumline mimicking the lost root structures of teeth. Reported to be the most like a natural tooth, they feel secure and stable in the jawbone and can be used to support any number of replacement teeth. Call our Kernersville, NC dentistry practice to schedule your dental implant consultation today. 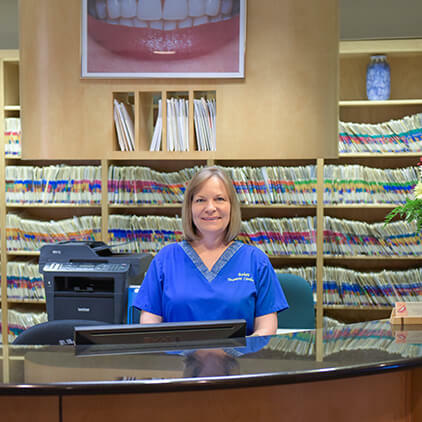 During your consult, Dr. Veronica Walker will determine if dental implants are suited for your tooth replacement through a careful examination of your dental health and a review of your overall health. Once we’ve determined dental implants are right for you, we’ll schedule your surgical implant placement procedure. For the first phase of the dental implant supported tooth replacement process, Dr. Walker will work with a trusted local oral surgeon or periodontist to ensure you receive the safest and most effective treatment. The surgical treatment requires the specialist to place a small incision in the gums where the implant post will be inserted and positioned in the jawline to support your replacement tooth or teeth. Then, a protective covering is attached to the implant post to allow the soft tissue to heal properly in preparation for the attachment of your prosthetic. Over the course of three to six months, the gum and supportive bone tissue fuse with the implant post, closely mimicking the function of tooth roots. Once this fusion process is complete, you’ll return to our office for the second phase of treatment where we attach your replacement tooth or teeth. Depending on the number and location of your missing teeth, we will recommend a crown, bridge or denture to attach to your implant posts. 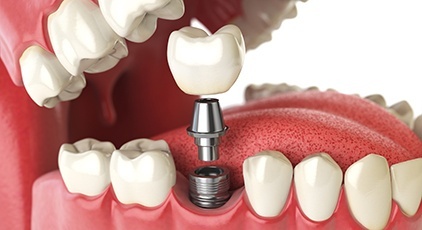 Single teeth can be replaced by attaching a dental crown to one implant post, and in some instances, two consecutive missing teeth can be replaced with fused-together crowns supported by a single implant post. For three or more consecutive teeth, two dental implants will likely be needed, one to support either end. Patients with more advanced tooth loss or who need an entire arch of teeth replaced should consider partial or full dentures supported by implants.